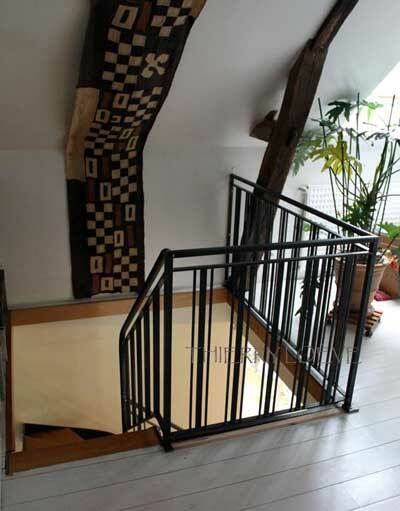 A big thank you to Thierry for this article explaining how he redesigned and rebuilt a staircase with metal strings around the original wooden steps. 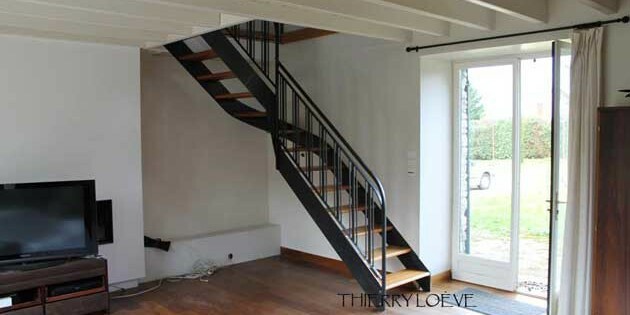 Thierry worked up this metal stair project on the Wood Designer forum using StairDesigner and our StairFile service. 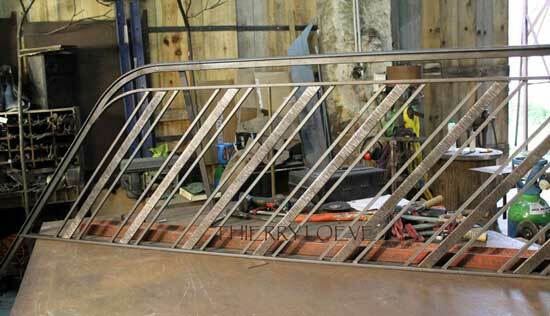 I’m a craftsman specialising in custom made wrought iron pieces, based in the Loire Atlantique since 2004. I’m often asked to build projects where technical problems need to be solved to improve the design. This is particularly true for metal stair design projects, where safety comes as the top priority. 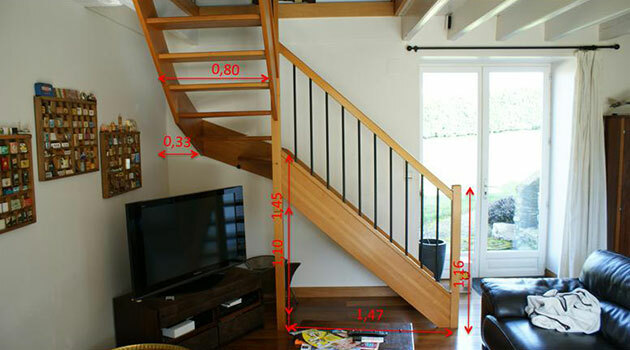 This is why for several years now, I’ve been using Ness’s services and Wood Designer’s StairDesigner software. Because stair building is not my main activity (I only build a couple of stair projects a year) I don’t feel the need to invest in the full version of the StairDesigner. So I prepare my projects with the free version and use Wood Designer’s StairFile service to get the plans. This way, as well as getting the plans, I also get my project revised as well as some invaluable advice on the best way to design and build. I’ve always found that working this way I can minimise errors and build projects faster and easier especially when the project is technically complex as is often the case. The last project that I built this way was for a customer near Nantes. The client wanted to redesign his wooden stair in metal and wood to give a more modern look and get rid of the central newel post. We had to integrate a fireplace and fit a TV screen under the stair. As I’ve made quite a few projects for this client (pergola, gates, furniture…), I knew what he liked and especially his taste for Art Deco. To create a lighter aspect and eliminate the central post, I proposed a project replacing the wooden strings with metal and an Art Ceco style handrail. To minimise the cost we decided to recycle the steps and design the metallic parts around the original step shapes. 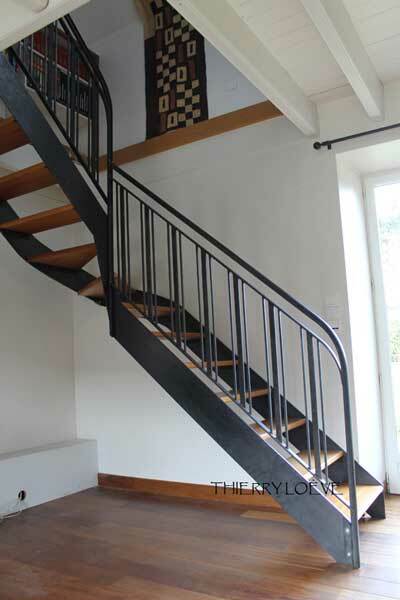 The existing stair and it’s reclaimed parts: the stair had to be designed so as to be able to use less space than the existing stair, free as much as possible the under stair space and reuse the existing steps. Fit the existing stairwell that was very irregular with walls out of plumb, and irregular and non levelled stairwell and first floor…some of the beauties of working in old houses. This project and its specific constraints gave us a whole series of problems with unknown factors. We were replacing the wooden 50mm strings to 10mm steel which enabled us to reduce the total width of the stair but made it necessary to redesign the stair stringer to fit the specific step size. This had to be done without knowing the exact sizes of the steps as we couldn’t measure the step penetration and most of the steps were odd shaped winders. I was also having a tough time getting the right size and configuration for the landing step. Finding myself a bit lost in all these constraints I called on Ness for help. With his help we were able to optimise the design and use all the original steps. It was only once these multiple problems were fixed and a workable design set up that I was able to make the handrail to the correct shape and size to fit the new stringers. Thanks to Ness and Wood Designer I been able to build a great project quickly and efficiently with no costly errors or rule of thumb rebuilding. Thanks to everyone who has helped me complete this project. To follow through the whole design process you can read the forum thread (in French) here. Click here for more details on our StairFile service.